2008-December-17: James Mtamakaya defends his M.Sc.E. thesis at 10:00 AM in E-11: Establishment and Maintanance of a New Real Time Geospatial Frame -TZRF10 for Tanzania. 2008-November-27: GGE presents the Semi-Annual Graduate Seminar in E-11. Details. 2008-November-26: Recruitment visit by Mission Geospatial Ltd. Presentation at 3:00 PM in E-11, with interviews to follow. 2008-November-25: Recruitment visit by MMM Group. Presentation at 11:00 AM in E-11, with interviews to follow. 2008-November-12: Brown Bag Lecture, 12:30 - 1:30 PM, in C-11: Least Square Spectral Analysis of Superconducting Gravimetry. 2008-November-3: Challenger Geomatics will give a presentation at 10:30 AM in the ADI Room (C-25), with interviews to follow. 2008-October-30: CARIS will give a presentation at 12:00 in E-11. 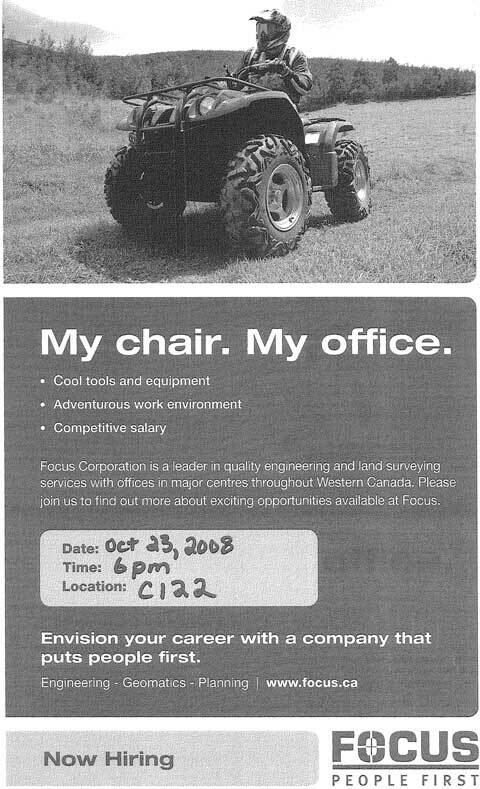 2008-October-23: Focus Corporation will hold a presentation at 6:00 PM in C-122, with interviews to follow. Details. 2008-October-22: Recruitment visit by McElhanney. Details. 2008-October-21: Midwest Surveys Inc. will give a presentation, 10:30-11:30 AM, in E-4. 2008-October-16: Tristan Goulden will be giving a Brown Bag Lecture from 1:00 - 2:00 PM in C-10 on his experiences this summer at Mzuzu University, Malawi. Tristan researched and taught in the Department of Land Management. Under the Direction of Mavuto Tembo, Head of the Department, Tristan taught courses relating to GIS and GPS and assisted in the Department's survey school. Students under the Land Management program at Mzuzu will become active, knowledgeable participants in the Malawi Land Reform program. This promises to be a very interesting lecture. 2008-October-9: Recruitment visit by Caltech Surveys Ltd. Presentation at 12:30 PM in E-11, with interviews to follow. 2008-October-7: Simon Banville presents his Ph.D. dissertation proposal at 11:00 AM in E-11: Accurate Real-Time Positioning of a Low Earth Orbit (LEO) Satellite with Simultaneous Atmospheric Sensing Capabilities. 2008-October-2: Recruitment visit by C & C Technologies Inc. Presentation at 10:30 AM in E-4, with interviews to follow. 2008-September-24: Felipe Nievinski defends his M.Sc.E. thesis at 10:30 AM in the ADI Room (C-25): Ray-tracing Options To Mitigate the Neutral Atmospheric Delay in GPS Applications. 2008-September-17: Ian Church defends his M.Sc.E. thesis at 2:30 PM in E-11: Developing a Nested Finite-Element Hydrodynamic Model to Predict Phase and Amplitude Modification of the Tide within Narrow Fjords. 2008-September-9: Our annual pizza party will be held from 12:00 - 1:30 PM in the main hallway, outside of E-4. All GGE undergraduate and graduate students, faculty and staff are invited. 2008-September-8: Ben Wuest defends his M.Sc.E. thesis at 3:30 PM in E-11: Towards Improving Segmentation of Very High Resolution Satellite Imagery. 2008-September-1 to 6: Graduate Student Orientation 2008. Details. 2008-August-30 to September-6: Undergraduate Student Orientation 2008. Details. 2008-May-28 & 29: UNB-Fredericton 179th Encaenia. Details. 2008-May-23: GEOIDE and GSN (GEOIDE Student Network) present Prof. Sue Nichols at 10:30 AM in E-11: Are You Communicating or Just Talking?. Did you ever wonder if you are talking to the air and no one is listening? Why can't people understand your point of view? Find out what kind of a communicator you are. What kind of a communicator is your supervisor? How can you bridge the gap? How can you use communication skills to make winning presentations? How can you make e-mail more effective? What messages do you give in an interview without realizing it? How can you communicate with students more effectively? While this session may not make you the ultimate politician, you should come away with some new ideas for improving your professional career. 2008-May-21: Krista Amolins defends her M.Sc.E. thesis at 10:30 AM in E-11: Mapping of GDOP Estimates Through the Use of LiDAR Data. 2008-May-12: Sheng Gao presents his Ph.D. dissertation proposal at 8:30 AM in E-11: Semantic Integration and Sharing of Geo-Referenced Health Data. 2008-April-28: Guest lecture at 2:00 PM in E-11: Coastal Surveys using Bathymetric Lidar. 2008-April-28: Pim Kuus defends his M.Sc.E. thesis at 10:00 AM in E-11: Bottom Tracking Issues and Recognition Thereof using SHOALS3000 Green Laser Beam in Dense Fields of Zostera Marina and Laminaria sp. 2008-April-21: Richard Chan defends his M.Sc.E. thesis at 10:00 AM in the ADI Room (C-25): Incorporating the Concept of 'Community' into a Spatially-Weighted Local Regression Analysis. 2008-April-8: Stephen Hibbert defends his M.Eng. report at 11:30 AM in E-11: Mapping and Documenting the First Nations Traditional Activities in Grand Lake Meadows. 2008-April-4: Brown Bag Lecture at 12:30 PM in E-4: The Can-Net GPS Infrastructure Service. The consistent, verifiable and rapid measurements provided by GNSS infrastructure networks are completely changing the way positional field work gets done. The Can-Net GPS infrastructure service comprises a series of on-line reference stations and VRS networks across Canada that provides the full spectrum of GNSS accuracies (1cm, sub-foot, sub-meter, 2-5m) in real-time and post-processing. Utilizing the experience gained through the establishment and management of Can-Net Mike will provide insight to the operation of and opportunities provided by such a GNSS network. Mike Wolfe has been working with Cansel Survey Equipment for over 7 years and his current position is the Can-Net GPS Infrastructure Systems Manager . He is a Professional Engineer with a Masters of Forestry, integrating GPS Navigation and GIS tools and holds a BScE in Surveying Engineering from UNB. He has worked as a consultant in the Surveying and Forestry sector for over 15 years. He thinks the Trimble Infrastructure gear is truly amazing and he is enthused and infused with the system. 2008-April-3: Midwest Surveys Inc. will give a presentation, 12:00-1:00 PM, in E-11. Interviews to follow, starting at 1:30 PM, in E-52. 2008-March-31: The University of New Brunswick chapter of Engineers Without Borders (EWB) welcomes Paul Martin, former Prime Minister of Canada, who will be speaking on a series of different issues pertaining to International Development and Relations. Details. 2008-March-27: Adam Chrzanowski will be giving a Brown Bag Lecture from 11:30 AM - 12:30 PM in C-10 on his experiences on the Mount Kennedy project. As most of you know, UNB's research was included in the National Geographic movie but Dr. Chrzanowski will be sharing some of his stories that weren't shown in the movie. 2008-March-25: Tri-City Surveys Ltd. will give a presentation, 12:00-1:00 PM, in E-11. Interviews to follow, 1:30-4:30 PM, in E-3A. 2008-March-18: Dineen Lecture: Nothing Great Happens Without Enthusiasm. 2008-March-10 & 11: GGE Graduate Seminar and Student Technical Conference. Details. 2008-February-20: The National Geographic video on the survey of Mount Kennedy will be shown at 7:30 PM in the Dineen Auditorium (C-13). Details of the survey. Why is there a Geomatics degree program at UNB? Why was there a need for a surveying engineering program in Canada in 1960? Why was UNB the first university in North America to establish a surveying engineering program? 2008-February-11: Underhill Geomatics Ltd. will give a presentation from 11:30 AM - 1:00 PM in E-4, with interviews to follow from 1:00-5:00 PM in E-52. 2008-February-8: Brown Bag Lecture from 11:30 AM - 12:30 PM in Head Hall Room C-9: Internship in Malawi. Malawi is a country of challenges. Bounded by Mozambique, Zambia and Tanzania, it is a landlocked country of approximately 13 million persons most of whom are involved with subsistence farming and live in the south and middle portions of the country. The United Nations Development Program places Malawi 166th of 177 countries included in its Human Development Index for 2006 (Canada ranks 6th). According to the UNDP, life expectancy at birth is 39.6 years and national GDP per capita is US $646 (2004) in a country which has seen its population more than double in the last thirty years. Tea, sugar and tobacco are the major export products. UNB students Erin Riley (LL. B. III) and Robert Kingdon (M.Sc in Geodesy and Geomatics) along with Professor John McEvoy (Law) traveled to Malawi in June 2007 to finalize a cooperation and exchange agreement between UNB and Mzuzu University in northern Malawi. For the students, the trip also commenced a twelve week internship experience under the auspices of the UNB Centre for Property Studies through the efforts of Dr. Ian Methven, Director and Veronica McGinn, Project Manager. The internships are funded by the Government of Canada through a CIDA program, Students for Development, administered by the AUCC and at UNB through the International Relations Office with Professor Ted Robak, Director, and Silke Klenk, Coordinator. Robbie Kingdon will talk about his experiences in Malawi and Veronica McGinn will talk about new opportunities for students this year. 2008-February-5: Schlumberger will give a presentation from 9:00-10:00 AM in E-4.